The day has finally come! You can enjoy Dale Kingston’s crushed velvet tuxedo in full HD glory as Suitable for Framing has joined the episodes available on the official Columbo YouTube channel. This is absolutely one of the best TV episodes EVER made, and in the gloved-hand reveal gotcha at episode’s end boasts the single greatest TV moment ever recorded (in this correspondent’s opinion at least)! NB – The Columbo YouTube channel TEDIOUSLY unpublished this episode on their site on 22 Feb, replacing it with Swan Song instead. So why not BUY THE WHOLE COLUMBO SERIES ON DVD HERE instead? Let’s compare notes! You can read my full review of Suitable for Framing here. You can also check out my personal top 5 scenes from Suitable for Framing here. Find out where Dale Kingston ranks in the list of most loathsome Columbo killers here. Go here to access the catalog of full Columbo episodes available to view online. 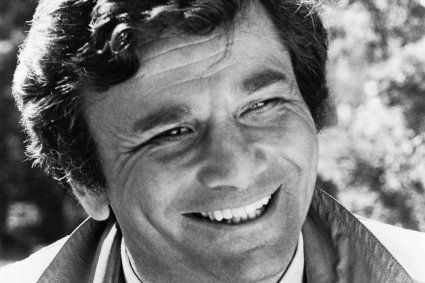 Access nearly 30 full Columbo episodes to view here. Visit and subscribe to the official Columbo YouTube channel here. Tags: Dale Kingston, Don Ameche, Kim Hunter, Lieutenant Columbo, Rosanna Huffman, Ross Martin, Suitable for Framing. Bookmark the permalink. Beats me, but it’s very annoying. It was only up for a few weeks and came down as soon as they made Swan Song available. Seems like they have a maximum of 6 full episodes available at any one time. They must be encountering some sort of copyright issues, what else could it be!?! I’m wondering who owns the rights to these episodes…could they not set up their own website and put them there? Perhaps cost is the issue too. I should have downloaded it, damnit. Has anyone done so? If anyone could share it that would be great. Suitable For Framing has such a clever “gotcha” ending and is done so subtly. Dale’s memorandum of accusations fell completely flat when Columbo reveals his all-the-time gloved hands. Would you review Identity Crisis? I’m partway through a close rewatch and really enjoying McGoohan’s direction and smash rendering of the sybaritic killer. And the historical references have me hooked – the episode aired months after the Hersh report revealed heinous CIA misconduct (and the Church Committee convened to investigate same) and the script checks every box, from the depravity of individual operatives to illegality emanating from the very top. Love! Hi there, I will get to Identity Crisis in the coming months! If anybody has an explanation for how Dale managed to get the two Degas pastels into one of Edna’s boxes of new clothing, please post a response. In the episode accessible on YouTUbe, at 1:05:00, Edna parks her car and walks away leaving some white boxes of clothing from the Fashion Center in the back seat. Dale soon stops by to peer inside the car to see the boxes. He then goes back to his own car to retrieve the Degas pastels from his trunk. And, as we later learn, of course, after this scene in the parking lot, Dale somehow managed to put the Degas pastels in one of the white boxes in the back seat of Edna’s car. But how could Dale have done that, since Edna surely locked the doors to her car before she walked away? Are we to presume that she didn’t lock her door and that Dale just got “lucky?”﻿ If so, that was a pretty risky move to rely on dumb luck because Dales the new that the police were going to shortly on their way to Edna’s house to search the premises. What an I missing here? Very good point! The only thing I can think of is that Americans never seem to have locked their cars, neither in movies nor television series, until the introduction of the remote control car key some years ago. They live in the safe, rich part of L.A. where no one thinks of breaking into cars! Don’t worry that this attitude is completely at odds with the heavy emphasis on security measures for their homes. Don’t forget when this was filmed! I myself started driving in the 70s, and I can remember when leaving cars unlocked when parking within suburban areas was by no means uncommon. They still made cars without hood locks back then. Any yay-hoo could steal your battery. I envisage that Dale knows Edna’s routine off my heart and has perhaps chided her in the past for her slack approach to security when leaving her car doors unlocked at the shopping mall. Thanks, David and Columbophile for your thoughts! I reconsidered Edna’s innocent character and wondered if she might have left the door unlocked since doing that could be plausible given her personality. So, I rewatched the parking lot scene again and I noted this time that Edna left open both windows on the driver’s side and the right front passenger side window as well! See 1:04:48. It’s quick, subtle, and can easily be missed if you’re focusing on other things, but this explains how Dale easily got access to those white shopping boxes. And it fits Edna’s personality. Again, great writing by Jackson Gillis. As Columbo said in “Ransom For a Dead Man, “I worry. I mean, little things bother me. I’m a worrier. I mean, little insignificant details – I lose my appetite. I can’t eat. My wife, she says to me, “you know, you can really be a pain.”” And as Columbo has said many times, “Sorry to bother you . . .” Thanks again to you both for helping me to clear this up. “Edna left open both windows on the driver’s side “– good catch. As much as I love this episode, it is never explained by Columbo how the electric blanket was used by Kingston to help establish his alibi. I suppose our assumption would be that because the fingerprint gotcha is so damning and conclusive, Columbo could retrofit an electric blanket explanation by finding it in the uncle’s house and arriving at a conclusion that that’s how the time alibi was created. The blanket keeps the body warm and delays the onset of rigor mortis. This would cause the medical examiner to place time of death much later than it actually was (they determine the approximate time by how stiff and cold the body is along with other factors), which is to say when Dale was at the gallery. Uh, I guess I wasn’t clear in my comment. I know that Kingston expected the warm body would obscure the actual time of death…..My question is: How does Columbo figure out that the presumed time of death was the result of the electric blanket? According to the medical examiner, it would have been impossible for Kingston to be the murderer, as he would have had to be in 2 places at once. There is never an attempt by Columbo to address that. I understand your question now. In several episodes including this one, the killers try to establish alibis by various means to make it appear they were somewhere else when the murder occurred based on the time of death. But Columbo knows that when the medical examiner establishes the time of death it’s a guess based on the available evidence, not a hard and fast determination. In the case of Kingston’s uncle, Columbo was certain Kingston did it. Columbo also knows that the time of death was based on temperature of the body etc. Columbo surely figured that Kingston committed the murder then figured a way to keep the body warm to throw off the medical examiner. An electric blanket is as good a means as any to keep a dead body warm. Given that Columbo has far more experience solving murders than the people who commit them, the ol’ warm the body trick simply didn’t fool him. Although this is my favorite Columbo episode, I certainly do not think that the ending is the best scene of Columbo or even the best gotcha, let alone the best scene in television history. I wouldn’t presume to select even my own favorite TV scene, but I would start by going to my all-time favorite series, Perry Mason (1957-1966). The first scene that comes to mind is from The Case of the Spanish Cross, in which Perry talks a young man, who is the murder suspect, into surrendering to the police. He talks about what it means to be a man, and that a man knows when another man is being honest with him. He says that sometimes a man realizes that he needs help and can’t make it on his own and has to reach out and trust someone. The young man has a gun and Perry walks away, but the young man eventually comes out of his hiding spot, and catches up with Perry, and they walk away together. Not only the idea but the way it’s shot– all the words are done. We’re left with the Lt silently proving his case. It’s about as conclusive a conclusion as you’re going to find. This was one of the first episodes I saw, and it’s still one of my favourites! Same here. It’s memorable from the first moments to the very last so really sticks in the memory. The final bit with the fingerprints… chills!! As referenced in the article, I rate the gotcha moment as the single best TV moment EVER! Oh, i LOVE this episode! Hurrah!